Watch this video to see what makes ThermalDry® Insulated Floor Decking™ a superior alternative to conventional wood subflooring in your finished basement. What kind of flooring do you want in your finished basement? A great basement floor should be beautiful, comfortable, easy to clean and able to last a long time. To meet these requirements, you need a topnotch subfloor treatment. That’s why we developed ThermalDry® Insulated Basement Floor Decking. This innovative subfloor system has no organic materials and is a superior alternative to built-up plywood subflooring. Total Basement Finishing has contractors all over the nation who are certified to install ThermalDry® Insulated Floor Decking™. Contact us to schedule an appointment with your local dealer! Waterproof. A little or a lot of moisture won’t damage this subfloor system. Hostile to mold. The inorganic composition of ThermalDry® Floor Decking provides no food or growing medium for mold. Insulated. A continuous layer of rigid foam insulation ensures that your finished floor surface will be warm & comfortable. Versatile. Use ThermalDry® Decking as a basement subfloor or over any concrete slab where finished basement flooring will be installed. Quick to install. Decking panels interlock and don’t require fastening into the slab. One-step insulating & subfloor. ThermalDry® insulated subfloor panels interlock to create a uniform substrate for your finished floor. The “old-school” technique for installing a basement floor often involved laying down wood “sleepers” on the concrete slab and then installing a layer of plywood subflooring to prepare for the finished flooring. Today we know that this subfloor strategy is prone to failure in most basements. Wood will absorb and hold moisture from plumbing leaks, spills, high humidity and dampness from your concrete slab. Damp cellulose (wood fibers) provides an ideal environment for mold and wood decay. So even if your basement floor looks great after it’s installed, a wood-based system will eventually need to be torn out and replaced. We designed ThermalDry® Basement Floor Decking to eliminate the problems associated with wood subfloors. You can count on ThermalDry® Floor Decking to provide the best value. Installing this premium subfloor system will help your basement floor look beautiful, feel warm underfoot, and last a long time. 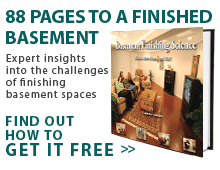 Contact your local basement finishing contractor to feel the difference! Perfect performance from innovative panels. ThermalDry® Basement Floor Decking combines waterproof foam insulation with a composite top surface. If you choose to have ThermalDry® Insulated Floor Decking™ installed, be sure to ask your basement finishing contractor about the floor covering options that are available. Our MillCreek wood flooring is a popular choice among homeowners - get the look of hardwood floors without the worry of them being ruined by water or moisture! For more comfort and energy efficiency in your basement and throughout the house, basement wall insulation is very important. High-performance wall insulation products from Total Basement Finishing can prevent future heat loss through your basement walls. All of our wall insulation products utilize rigid foam insulation, which outperforms fiberglass insulation in key areas: stability, durability, R-value and resistance to mold & moisture damage. Contact Total Basement Finishing to setup a consultation and estimate with your local authorized Total Basement Finishing dealer today!